Summary: The one secret she cares about keeping—her identity—is about to be exposed. Unless Lauren “Panda” Daniels—an anonymous photoblogger who specializes in busting classmates and teachers in compromising positions—plays along with her blackmailer’s little game of Dare or . . . Dare. Review: I had heard only great things about Lamar Gile’s latest book so I had high expectations and they were surely met. Endangered is a fun summer read that I picked up at just the right time. The novel moved at a quick pace as Panda tried to discover who the Admirer is, while her life spins out of control due to her own actions. I am often a bit wary of mysteries because I try, like most readers, to figure out “who done it” before the main character, and with Endangered, I didn’t figure it out who the Admirer was until Panda uncovered the clues. I love mysteries such as Endangered where the reader is consistently second guessing everything and being wrong. Once the Admirer was revealed, I thought back to the little clues that Giles left and marveled how the answers were there all along, but he masterly misdirected the clues keeping Panda, and the reader, guessing. One of the many aspects of Endangered that I loved was the YA tropes that Giles subverts throughout the story. The first is Panda’s relationship with her parents. Both of her parents are involved, to a certain extent, in her life. Like any modern teen, Panda does have her secrets but when she realizes she needs their help, she doesn’t hesitate to share her knowledge with them. She confesses her double identity and her “game” with the Admirer and how it relates to the murder to a student. This creates tension between her and her parents throughout the rest of the book, but I greatly enjoyed that the parent/child relationship was realistic and present in the novel. Another trope that was inverted was the “romance” angle, if you could even call it that. Panda’s ex-boyfriend Taylor Durham, whom she clearly hates, re-enters the picture and ends up helping her sort out the mystery. While her feelings towards him change through the story, from animosity to friendship, he clearly still has feelings for her. She does recognize her old feelings for him, but the hurt he caused her keeps her guarded around him, initially. Through the events of the story, they slowly rebuild their friendship by forgiving each other and becoming honest with each other. It’s a very mature relationship and also very realistic. I guess, based on these two aspects alone, that I loved that fact people actually communicated with each other in the novel. One of the YA tropes, or rather literary tropes, that bug me is that in order for much of a novel to make sense, people don’t communicate their knowledge with each other creating misunderstandings to drive the story forward. Giles throws that trope out the window effectively showing us that a story can be exciting and entertaining even when folks are honest and communicate. I loved the characters, Panda, especially. She is fiercely smart girl who believes she is handing out justice, while not realizing she’s doing the very same thing she accuses the bullies of. The reader completely understands Panda’s position and emotionally connects with why Panda exposes the dirt on her classmates, as some of them are truly despicable people. When her life starts to fall apart because her identity is exposed, Panda’s heartbreak and her desire to repair the hurt of others, specifically her friends, is really what makes Panda real. This line “We’re all something we don’t know we are” is repeated throughout the novel as Panda begins to recognize who she was and comes to learn who she really is. She learns to forgive those who hurt her, hurt others, and also learns to forgive herself. 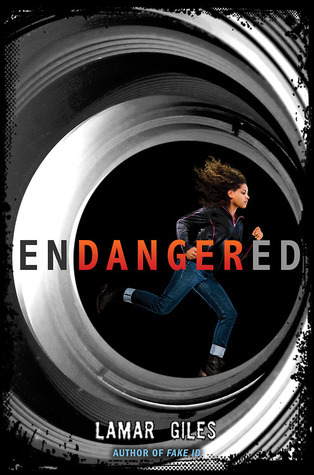 Like I’ve stated many times before, Endangered is a very realistic novel in terms of how the characters relate to each other and the relationships, along with the mystery, is what makes this story so wonderful. I was drawn to not just Panda, but Taylor, and even the Admirer. In fact, once the Admirer is revealed, I actually felt sorrow for the character (and actually that reveal is a wonderful plot twist that I absolutely loved!). Giles wrote a novel that is thrilling and exciting on the surface, but so much deeper when you get to it’s heart. Recommendation: If you love compelling mysteries with lots of twists and turns, get this soon!